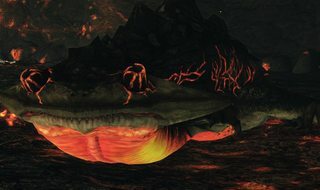 Obtaining the Iron Key will open the door near The Last Giant boss room, giving full exploration to the lizards burrow. Additionally, you can jump on top of the flaming barricade that keeps the Lizard inside the room (you don't need the Silvercat Ring, but you will need at least 10 VGR and full HP in human form). You can also jump through the hole where the Salamander guarding the Fire Longsword chest stays (after killing it), this will require a well placed jump but it's possible. Has an animation for getting plunging attacked. If you happen to fail landing on them but still deal damage normal attack damage, they may go through the plunging attack animation without you. If you kill all the lizards, fire pillars on the upper level will be extinguished (but you still die if you fall into the pit). The Lizards' physical attacks will ignore all forms of blocking. Upon death they will (sometimes?) leave a ball of fire that will linger for about 6 seconds and can definitely kill the unsuspecting player looking for drops. It also blends in with the fire ground environment the salamanders reside in so be careful. There are four of them scattered around the area past the door in the hallway leading to the The Last Giant. Hitting any body part other than their Head will deal double the damage. Fireball x3 - At far distance, the lizard will take a deep breath, and release a chain of three fireballs. Fireball spray - At mid distance, the lizard will take a deep breath, and spray multiple fireballs from left to right and back. Charge : The lizard uses its head to charge at you, this attack is very fast. Dangerous if the lizard keeps using it repeatedly. Tongue Strike : Lifts its head up and uses its long tongue to strike. Tongue Swipe : Tilts its head to the side and uses its tongue to swipe from left to right. Lunge : Tilts its head down and does a dolphin dive at you, it will keep sliding for a distance before stopping. Bow and Arrow - Bait these lizards into their fireball shooting attack, wait for the attack to finish, and shoot them with arrows. Repeat until they're dead. Poison - Can be poisoned. Use Poison Arrow or Poison Throwing Knife. Poison takes 90 % of their health, making the fight easier. Fire Resistance - Flash Sweat is especially useful when tackling the lizards. Also try the Flame Quartz Ring. You can kill the 2 lizards on the upper level from above. You might need to bring up the other elevator that lead to the Last Giant boss and stand on it to snipe the other lizard, then drop down and lure the Lizards below , they will not follow you if you stand on top of the slope lead to the lower level, but if they use the dolphin dive move and get to the upper area they will attack, if this happen, run to the lower level immediately, fight on the upper level is very dangerous because it's easy to fall into the fire pit.